Today is just beautiful! I got most of the wedding invitations done, so I took a bike ride out to the park and read by a pond for a while, then over by a small shopping area. 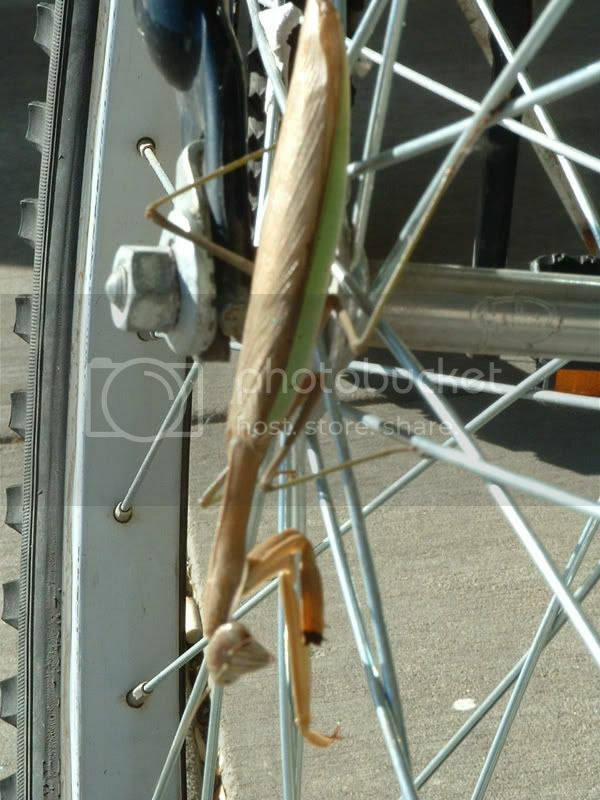 When I went to get on my bike, I noticed a preying mantis was resting not so peacefully between the spokes of my still moving bike tire. Faced with the dilemma, I thought I could coax the little guy off by getting him on a leaf to no avail. Poor guy had already been in an accident too, half his big front leg was missing. Finally I had to show him what would happen if he didn&apos;t get off. He held on for dear life as I walked the bike along, round and round… he eventually plopped onto the inside rim and tried climbing back up before I plucked him off and set him in the grass. What a cutie though! Check him out. People have asked how I am able to stay small even with my sometimes annoying addiction for yummy food. I thought I would say a few words in regards to that. First, I have a small frame, so my body tends to look small. I also know my limitations and when I&apos;ve stepped over them. Staying in shape is a whole lifestyle; here are a few thoughts on the matter. 2. Don&apos;t eat fast food. None. It&apos;s not real food, even if it&apos;s a salad they do something to it that&apos;ll clog the arteries. If you are hungry at work, for instance, don&apos;t run to a fast food joint. Snack on something healthy and drink a lot of water. You&apos;ll be all revved up for dinner when you get home (but don&apos;t stuff yourself, and never eat past 7 p.m.!). Lunch is not an essential meal of the day, but it&apos;s a good idea to snack a little in between. 3. Cut down on the red meat. Have it on rare occasion only. It tends to be harder to the stomach and not process very well. Plus, you feel all sleepy and sluggish afterwards. 5. It&apos;s okay to be lazy and watch a movie. I love movies. Especially after a long day. But don&apos;t just sit there. Do some leg or arm stretches that don&apos;t interrupt the viewing but don&apos;t let your idle hands want to grab something from the fridge. 6. No soda. It makes one gassy-burpy, eats at your teeth, and can be unpleasant in the tummy. I will once in a blue moon have a soda, but only because I have had too much tea (also not very good, lots of caffeine, but better than coffee). 7. Be happy! This isn&apos;t always easy, I know, but stress will kill the metabolism to the core. Don&apos;t take everything like it is the end of the world, or at least be serious about it, and no yelling! Be coooool… things happen, deal with it. And learn from it. I won&apos;t continue, I could come up with lots of suggestions. I find my life is easier when I don&apos;t have to watch my language (no swearing at all means I don&apos;t have to keep my mouth in check with little&apos;uns around)=less stress. I don&apos;t drink alcohol, which actually is a depressant and the body doesn&apos;t handle well (check for a beer belly). If the sun is shining, go sit outside instead of inside; there&apos;s magic in the air that&apos;ll make you thinner… hee hee O:-) (it relieves stress). These work for me, they might work for you. I don&apos;t claim them right or the best philosophies. I am felicitously pertinacious towards these because I made a promise to myself a long time ago. My family has a lot of health problems that I refuse to take medications for, arguing that they won&apos;t become problems if I do everything I can to slow them down. I haven&apos;t done the best job at it, I&apos;ve slipped a few times, but I have now cut candy out of my diet, and slowly taking away the sweets. Do remember, a sudden change is hard to do; start doing one thing at a time and build from there, and before you know it you will have changed. For the better I hope. 🙂 And do remember we are all awesome in our own ways, regardless of an extra five pounds. I keep adding people to my networks in Facebook and Myspace, but while it answers the question of “where are they now?” it also rapes the innocence of childhood memories. Okay, so that may sound drastic, but I think about people in my past, I think of them as if they are still the same. Reconnecting with them, I see they have grown as well (this is, of course, a “duh” thing to say, but when it comes to memories, I think we all do it). I believe I have posted on this before, but it becomes overwhelming at times. Of everyone, I think I am the most like I was in high school. A little biased I know, but when I do talk to people I used to know, they all drink and do all these things that seem to somehow transform them into people I don&apos;t know. I still don&apos;t smoke, drink, swear, party, drink coffee, do drugs, etc. I don&apos;t know if that makes me boring… is that what I am supposed to be doing at this age? I think it&apos;s just silly. But with Facebook especially, you can watch other people&apos;s lives, essentially. Okay, I admit, a bit stalker-esque, but the feature can be turned off if wanted. To see some of the pictures people post, or what they are doing… it&apos;s great to connect with them and be able to contact them when I need to, but I feel more an outsider than ever. I tried talking to a close friend I haven&apos;t seen in ages. It&apos;s hard sometimes. Then they&apos;re always going off to meet with their friends, and I am stuck in this apartment. Not like I don&apos;t have a million things to do that force me to be here, but people just don&apos;t want me around. I&apos;m like the stick in the mud (or people have families, that usually creates a barrier…). I hate that about getting older. I don&apos;t participate in all these “grown up” things, and somehow I don&apos;t fit into any group. Not even my memories, the people I knew from my past. Even the closest social network, that between two lovers, is distant for me. At least I get to talk to my fiancee daily, but it really isn&apos;t the same. So, while it&apos;s wonderful to finally connect to all these people again and it gives me some comfort to know that I am not forgotten completely, it is unsettling. I have never felt more lonely than I have in Kansas. Not even a video game friend to play with – the madness.